After four years of horror, the First World War ended on 11 November 1918. Ten years later, a Belgian veteran named Clemens De Landtsheer made With Our Troops on the Yser, a film on the ‘Great War’. The film is neither a triumphant retrospective nor an objective documentary, but a bitter protest in which the hardships of ‘our boys’, the simple soldiers at the front, are central. As secretary of the ‘Yser Pilgrimage Committee’ De Landtsheer was part of a movement with a political agenda: to promote Flemish nationalism by emphasizing the purportedly disproportionate suffering and abuses endured by Flemish soldiers during the war. To this end, his film combines authentic archival footage from the war with staged images from existing fiction films, as well as a tendentious voice-over commentary. The result is both a unique cinematic experiment and a fascinating historical document, as Daniël Biltereyst (Ghent University) and Roel Vande Winkel (Ghent University – University of Antwerp) explain in the extras on the DVD. 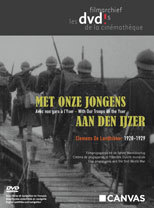 With Our Troops on the Yser was screened more than 400 times in the interwar period. Its success inspired De Landtsheer to found the company Flandria Film. The fascinating story behind De Landtsheer’s film career is also illustrated in the extra documentary on this DVD, accompanied by several Flandria Film productions. With Our Troops on the Yser was originally released in 1928, but was subsequently revised and augmented several times. The version on this DVD is the definitive colour version of 1933, restored by Noël Desmet (Belgian Royal Film Archive). The soundtrack is based on the original musical recordings used by De Landtsheer to accompany the images. The film can also be viewed with a scholarly audio commentary (in English, French or Dutch) co-written by Leen Engelen (Media & Design Academy), Roel Vande Winkel and Bruno Mestdagh (Royal Film Archive). The film runs for 83mins, and comes with Dutch intertitles and English or French subtitles. Bonus features are three other Flandria Films productions by Clemens De Landtsheer: 10th Yser Pilgrimage (1929, 12 mins), Winter Has Come – Ice Festivities at Temse (1933-1934, 5 mins), Jules Van Hevel Tribute (1935, 9 mins); and a 25mins documentary Clemens De Landtsheer, by Daniël Biltereyst, Roel Vande Winkel and Erik Martens. Clearly this a pamphleteering film demanding contextualisation, particularly knowledge of Belgian nationalism, and the understanding of the experience of the war from the Flemish point of view. The commentary is provided by some of the leading lights in film and history today. Well done to all concerned for bringing out this title on DVD and widening our understanding of how film of the war was used and understood, not just during the conflict but in its aftermath. 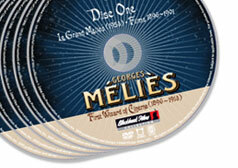 The DVD is Region 0, and is available from the Cinémathèque Royal de Belgique.